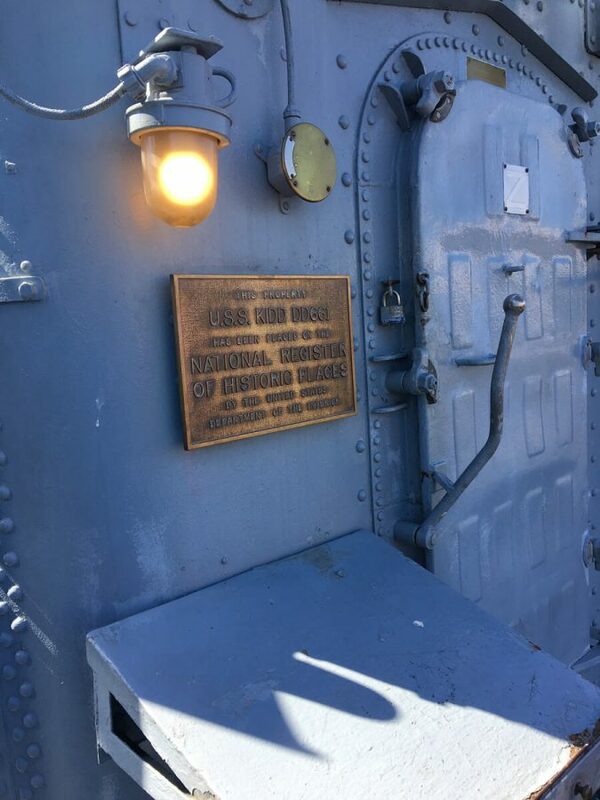 Located directly across from the Combat Information Center (CIC) was the Captain’s Inport Cabin. This is where the Captain lived when the ship was in port. While cramped, he did have two portholes and a private head. The Captain was the only person aboard ship to have a private bathroom. 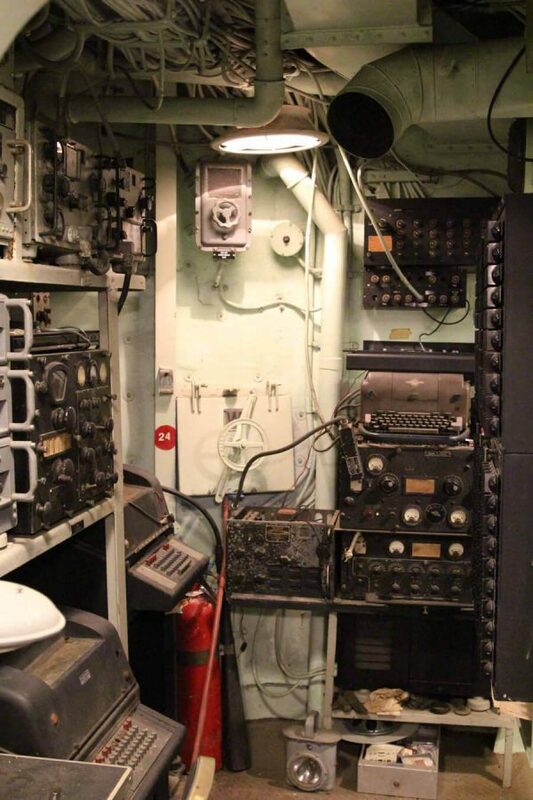 When built in 1943, the Captain’s Cabin was located in the area that is now the Combat Information Center (CIC), and the ship’s doctor lived in the outboard cabin. With the advent of radar information gathering, space was needed for more sophisticated equipment. So the Captain lost his large cabin, and was moved into the doctor’s stateroom. The doctor was bumped to a cabin down below in Officer’s Country. Such is the expansion of equipment in a limited space. 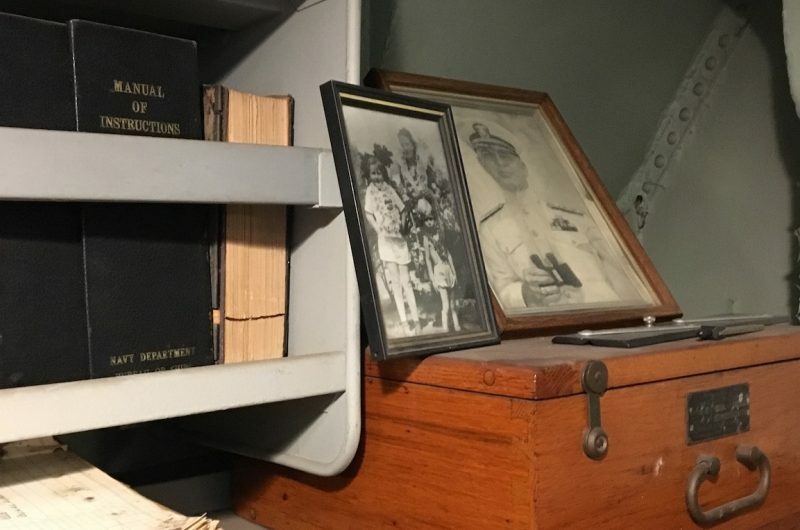 The uniforms and memorabilia seen here were donated by the late Rear Admiral Allan B. Roby, Sr., the KIDD’s first commanding officer. Just aft of the Captain’s stateroom and under the ladder leading up to the 01 level is a small closet known as the Small Arms Locker. 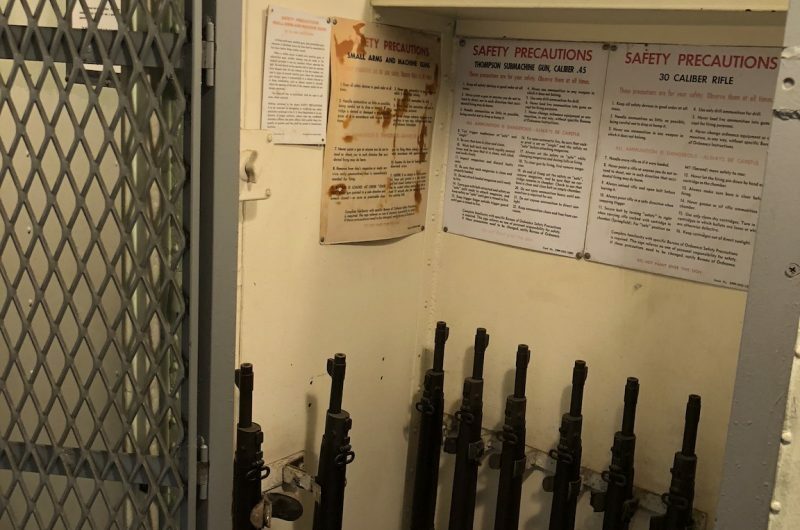 In the Small Arms Locker was space for 22 rifles. 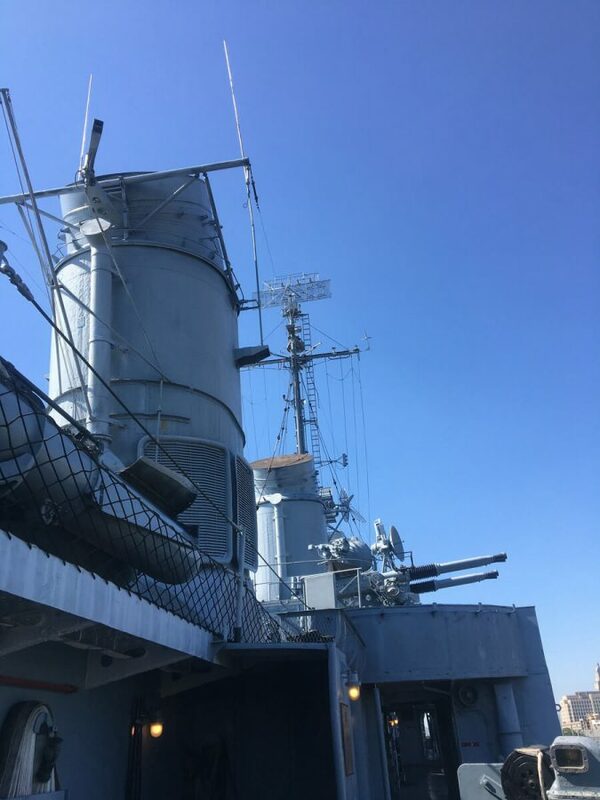 The ship was equipped with rifles, pistols, and “Tommy guns”—Thompson submachine guns like those used by mobsters in the 1930s—to provide shipboard security and to equip a landing party should such a need arise. The rifles were also used by shipboard personnel on occasion to detonate floating mines found drifting near the ship. 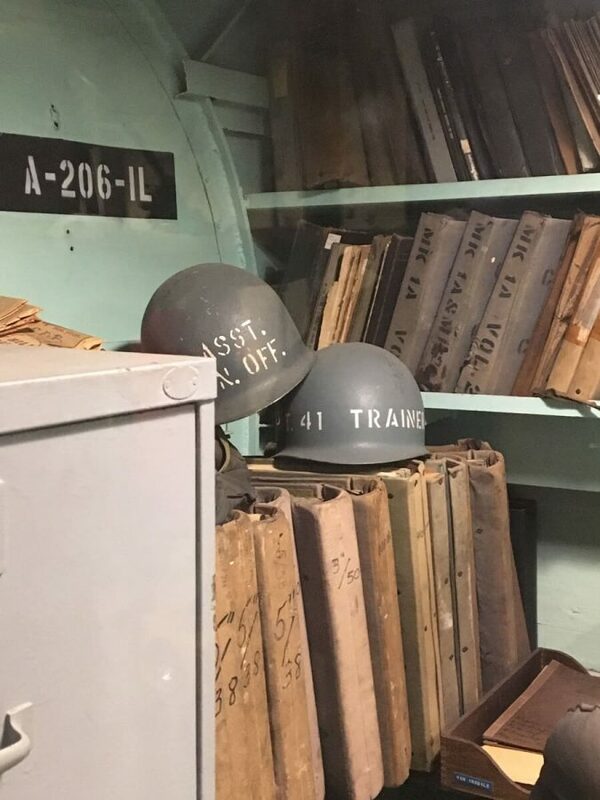 The standard outfit for a World War II destroyer small arms locker included 30.06 Garand rifles and .45 caliber automatic pistols. 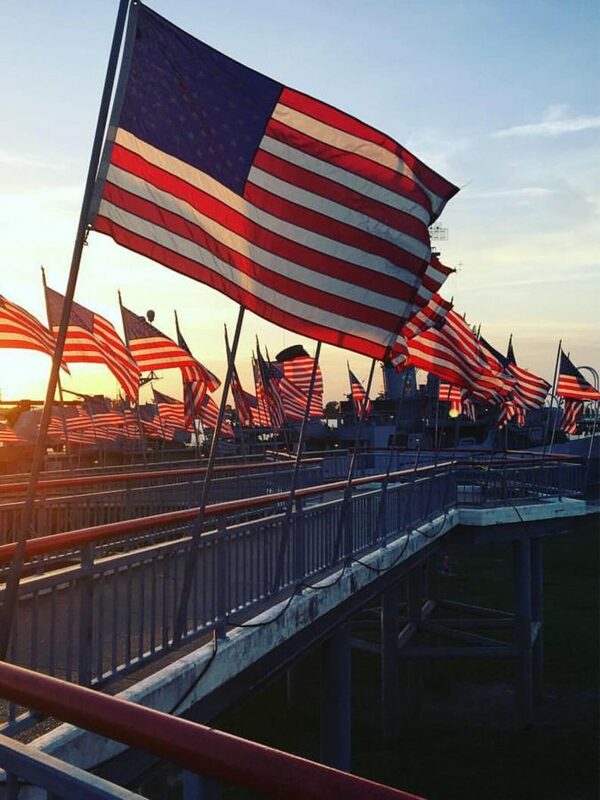 The ship also carried a few .50 caliber and .30 caliber machine guns and submachine guns. Such lockers would traditionally have held the M-1903 Springfield rifle, but by the end of World War II this venerable weapon was slowly being replaced by the Garand. The type currently on display aboard the KIDD is the original M-1903 Springfield, courtesy of the U.S. Army.